AC line filter 5 amp with IEC connector. Infrared photo transistor receiver T1 & 3/4. 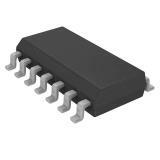 14 leg SOIC package 74LS14 Inverter with Schmitt Trigger integrated circuit.